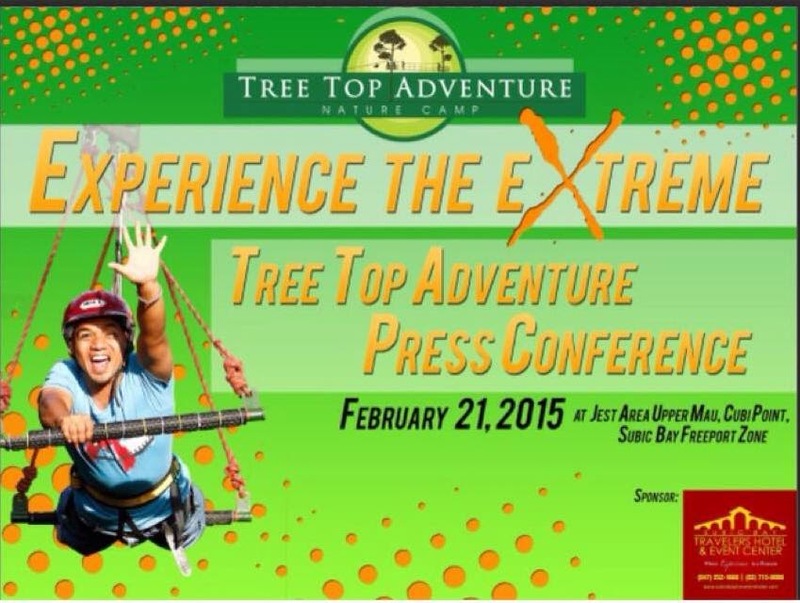 The Tree Top Adventure will hold its very 1st press conference and media tour in which over twenty participants from the TV, online, radio and print industries will attend this February 21, 2015. A short program with a question and answer portion will take place first before the tour, in which the participants can try out all the rides. This includes the motorized team building facilities--the first in the Philippines. Tree Top Adventure’s CEO, Ms. Ma. Camille O. Montejo, will grace the activity. Tree Top Adventure features six activities: two slow paced and four fast paced activities for the thrill seekers who want to experience extreme adventure. One slow-paced activity is the Trekking adventure in which you’ll be toured within the area. The tour guide will be introducing local plants and trees and share interesting facts about them. If you want to see the forest and appreciate nature from the top of the trees, you will surely love Canopy ride. The entire ride has a hanging bridge and five stations which can carry three persons at a time in which you’ll be transferring from one tree to another. For heart pounding activities, one might want to try the Superman Ride, a horizontal motorized zipline in which you’ll be soaring back and forth in less than a minute. To quench your thirst for adrenaline rush, try out the parachute fall---a ride in which you’ll be propelled upwards, slowly, and just when you’re 75 feet above the ground, you’ll be let loose for a suddenly fall. If you literally want to surf in the air, you could try the Silver Surfer, an inclined zipline that swings you back and forth between two trees. The Tree Drop, on the other hand, let's you experience the extreme! You will be suspended 60 feet above the ground, mission impossible style and be dropped in a matter of seconds. Do try out Tree Top Adventure at the JEST Area, Upper Mau Cubi Point Subic Bay Freeport Zone or at the Camp John Hay Baguio City. Baguio City branch will also hold its press conference and media tour on March 14, 2015. For more information, you may contact 09166299381. Visit the website www.treetopadventureph.com for updates. Like Tree Top Adventure Facebook page www.facebook.com/treetopadventurecamp , follow them on Instagram @tree_top_adventure and on Twitter @TreeTopPH for details.